Dallas, TX (RestaurantNews.com) Are you witty, inspirational and creative? How about a student looking to further their higher education goals? If so, the future is in your hands. 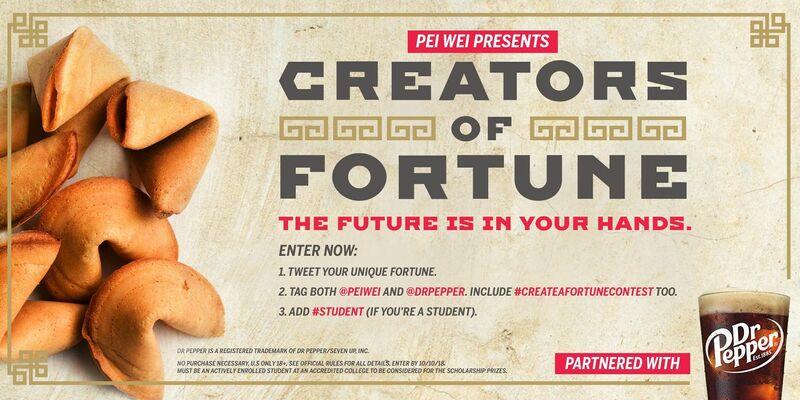 Pei Wei has partnered with Dr Pepper to host an all-new “Creators of Fortune” Contest, beginning Thursday, Sept. 13 – National Fortune Cookie Day. Guests are invited to post their own creative and original fortune on Facebook or Twitter between Sept. 13 and Oct. 10 for the chance to win a $1,000 scholarship and more! Add your inspirational or witty fortune (as a comment) to Pei Wei’s Creators of Fortune Facebook post or tweet it out via your personal account. Tag both @PeiWei and @DrPepper. Include #CreateAFortuneContest too. If you’re a student, be sure to include #student to become eligible to win a scholarship prize. May good fortune be your destiny! Five lucky students will be eligible to win a prize that’s sure to help them create a fortunate future. One grand prize winner will receive a $1,000 scholarship and four other lucky participants will each win a $500 scholarship. Other prizes include $5 Pei Wei gift cards and coupons for a free regular beverage. Winners will be selected by a panel based on judging criteria. Pei Wei will begin notifying winners starting Oct. 25. In order to win a scholarship prize, the entrant must be actively enrolled at an accredited college or university, taking at least six credits. For prize and detailed rule descriptions, visit peiwei.com. The last day to enter is Wednesday, Oct. 10. So hurry and crack open a fortune cookie from your favorite Pei Wei for inspiration, then give it your best shot! Founded in 2000, Pei Wei Asian Kitchen, is the leading fresh Asian, fast-casual restaurant that honors Asian culinary tradition by wok-searing premium ingredients in portions that satisfy. Pei Wei – recently ranked “The 9th Most Popular Restaurant Chain in America” by national research firm Datassential – makes each plate with bold, Asian flavors that couple sit-down quality with take-out convenience. Menu offerings include lighter options such as lettuce wraps, salads, sushi and quinoa bowls as well as wok classics featuring rice and noodle bowls. Pei Wei offerings are easily customized for a variety of palates and diets, including gluten-free and vegetarian. Pei Wei owns and operates over 160 restaurants in 21 states. For more information and the latest Pei Wei news, visit peiwei.com, or follow Pei Wei on Facebook, Twitter and Instagram and Tiger on Twitter.